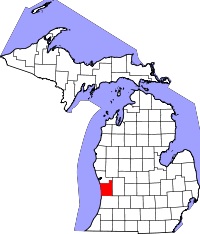 With about 265,000 residents, Ottawa County is one of the most highly populated counties in Michigan, and the County Clerk Vital Records Department reflects that, offering a large variety of ways to access and research the genealogical records of the area. The Vital Records Department, which can be emailed directly with inquiries, allows up to four researchers at once in the primary research area (additional location addresses are provided on the departments webpage). A general Genealogy Research Application must be filled out prior to being allowed access. Within the office, birth records begin in 1866, deaths in 1867, marriages in 1848, divorces in 1898, criminal records in 1859, and naturalizations from 1852 to 1910. A free online database of death records beginning in 1946, and marriage records beginning in 1931 is also provided which allows searching of, and ordering certified copies of records.